For our flight over, we got a deal on tickets through British Airways whereby we got Economy Plus seating for just $50.00 more per seat on the new direct flight from San Jose to London on the Dreamliner. Boy was it worth it. A lot more seat room, and perks like champagne upon arrival. We could actually tolerate (if not enjoy) the flight over as we weren’t squished in like sardines. Once in London we had to deplane down stairs, then take a bus, then walk up and down a bunch of hallways, ramps and stairs, then take another bus, and then take a train to our departure terminal for Barcelona. That flight was fine, no special seating but it was a short flight so it didn’t matter. Once we arrived at the Barcelona airport we were greeted by a driver from Gaudi’s Nest, the apartmentbuilding where we were staying. Wow, what a nice place! After we signed in we went to the apartment #3 on the 4th floor (but up five and a half flights of stairs). What a view! The next day we woke up and went in search of breakfast. No easy feat in a city that doesn’t wake up until 10:00am! Even bakeries don’t open until 9:30! I got some coffee at Costa Coffee, a Spanish chain like Starbucks, and we started walking and walking. Finally found ourselves at Brunch and Cake which did have a nice hot breakfast for us, yay! 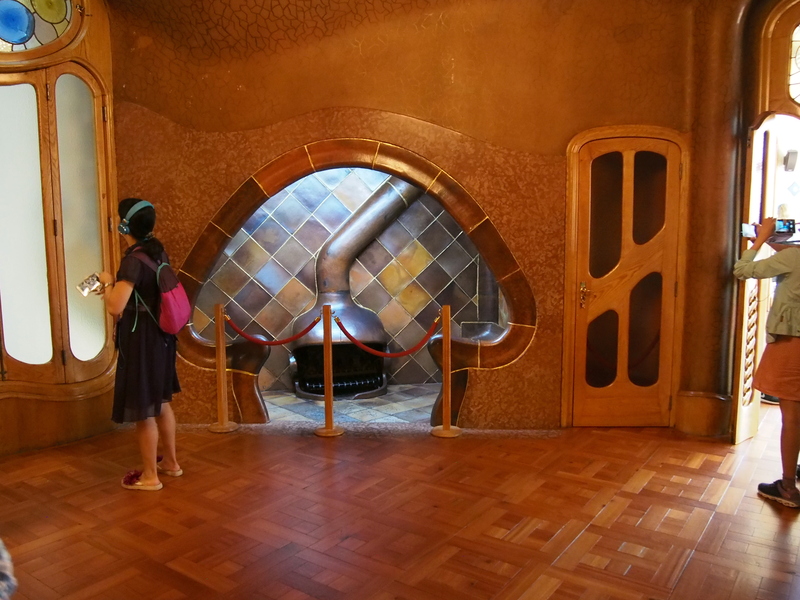 By now we were very close to Gaudi’s Casa Batllo, which I had already bought tickets for but left back at the apartment, thinking we were just running downstairs to a bakery. Fortunately they were on my phone and so we began our tour of the house during this relatively uncrowded time. Some parts of this house were beautiful, others just strange, but definitely a unique architectural style. And a very interesting guide on an iPod where when you pointed the guide at something in the house it would show you more detail, like adding people and furniture to the house model or turning the turtle shaped window into an actual turtle that swam away. 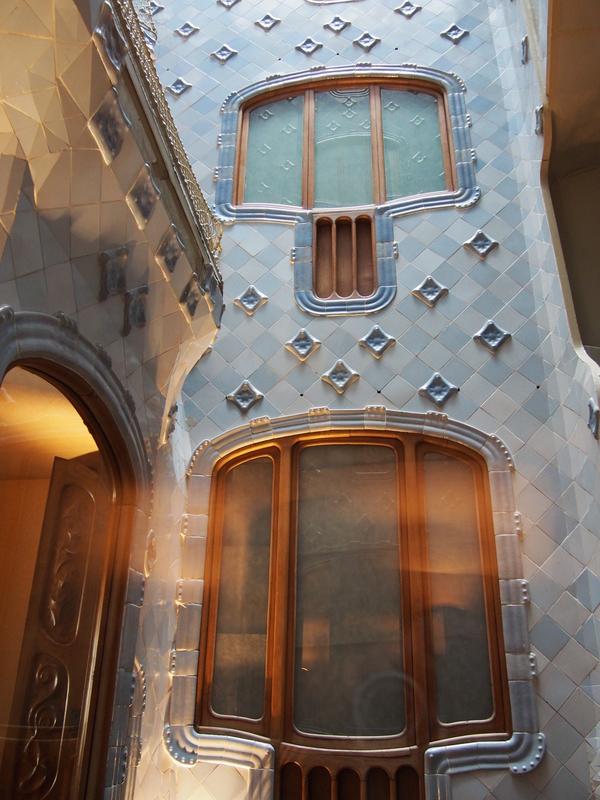 After we finished with the house tour, we walked along the street admiring the other famous buildings and then down to La Pedrera, Guadi’s other famous building, although we didn’t go in. We shopped a little and walked a lot, then went back to our apartment for a br eak, after which time we took the subway to the Gothic Quarter for our food tour. We arrived and found our guide and we were the only people on the tour. We started in the food market where she pointed out the differences between the Iberian hams (bellota is the one you want, because that means the pigs only ate acorns) and also some different cheeses but we didn’t get to try anything. Next we walked a bit and went and had tapas. We were being a bit troublesome because we didn’t want the specialty, pulpa, as that is octopus and octupi are smart so it would kind of be like eating a dolphin. So they made us something else but as you can see the tapas were not remarkable as I don’t remember what we had. Then we walked and walked and walked and the guide explained a bit about the city but she was a new transplant from Venezuela so she wasn’t able to answer all of our questions. Then we went to our final restaurant, had a bit more unremarkable food, and we were done. The guide was nice but overall certainly not the best tour we’d ever taken! We walked around some more until it was dark, then once back at our apartment Charlotte and I went up to the roof deck to see the cats that lived there but they were too shy to let us pet them. We were able to have breakfast in our apartment because we had gone to the grocery store the day before, which worked much better. Then we set off to see the inside of the Sagrada Familia. Except you don’t just see the inside, you buy timed tickets for entrance and the soonest time wasn’t until the afternoon. So we got our tickets for later, and then took the metro to the Gothic Quarter to explore and shop. It was mighty quiet as it was early for the Spanish people, but we started in the market where I got some bellota ham to try later and Genevieve got a smoothy. Then we headed out, Charlotte and I bought some ballet flats at Kokua, Genevieve got a cute pair of espadrilles from Lluis Manuel, we got some other stuff, had churros y chocolate even though it was absolutely the wrong time of year and way too hot for that, and had a nice lunch at a recommended tapas restaurant. Then we headed back to the apartment to drop off our packages before our Sagrada Familia tour. Man, that church is so beautiful inside. The outside kind of creeps me out with the stalactite-ish facade, but the inside with the light streaming in through the windows and how light and airy it is! Definitely one of the best churches I’ve ever seen. After spending a few hours there, we returned to the apartment and then later went out for dinner at the recommended Cervecceria Catalana. Reviews of this place put it either as amazing or overrated. We’re in the overrated camp. That night we went up to the rooftop deck as a family with wine and olives and enjoyed the marvelous view of the city. This morning we went to the Picasso Museum, which was interesting, especially the exhibit of X-rated sketches he h ad done for his friend late in his life. Dirty old man, who knew? We had a snack of Argentinian empanadas at La Fabrica (Oh Mmoon argentinian empanada place in San Jose, why did you have to close?) and then went to the beach at Barceloneta. A long walk and it was getting pretty hot, but the beach was really pretty. 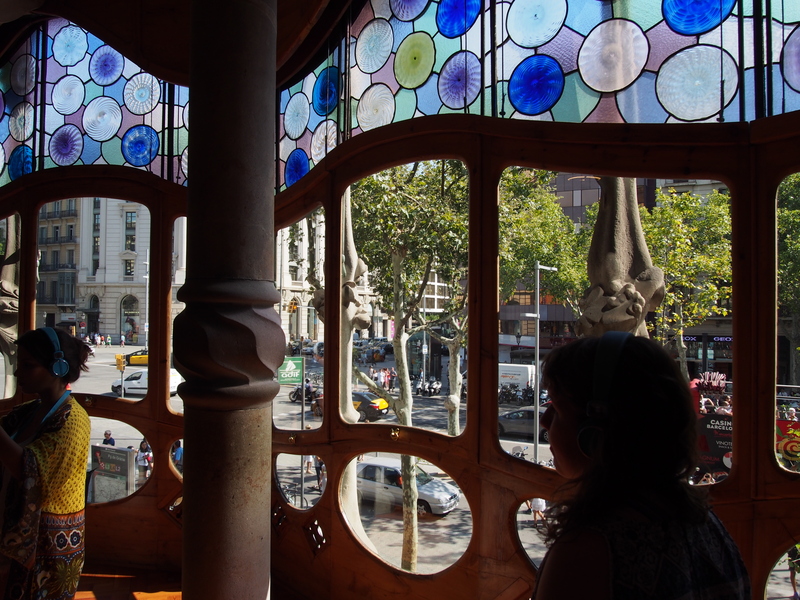 Then we headed back to Barcelona, had a late lunch and then headed back to the apartment. We had Italian food at a chain restaurant, La Tagliatella, which was fine. You can only have so many tapas before you need to branch out! We had an 11:00am admission to Park Guell which sounds reasonable but we were on Spanish time now. It didn’t even get dark until nearly 10:00pm so it was hard to go to sleep early. We took a taxi to the park and did get there in plenty of time. Walked around and took all of the photos and enjoyed the parrots and the architecture. Then we took a taxi back to the Opera House, looked inside briefly, then walked down Las Ramblas and back to the Gothic Quarter for a bit more shopping (had to visit La Cure Gourmande for our french lollipop fix) and a nice lunch at the Cafe Ocana in the Placa Reial. We went back to our apartment to rest and we were all too lazy and burnt out to go anywhere real for dinner so we had a quick dinner of sandwiches at a little sandwich shop near the Sagrada Familia. And for fun, a little movie of Barcelona highlights (well except for the last one) that Google made.